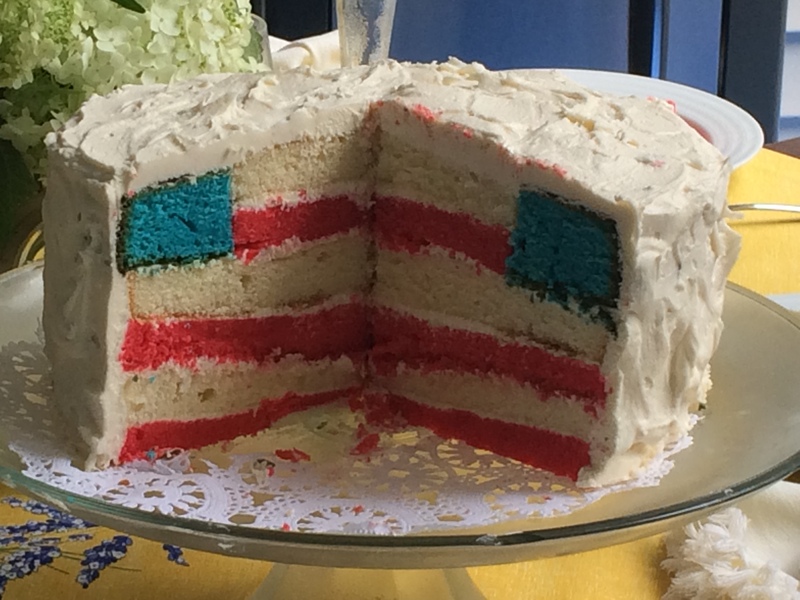 Okay, I’m finally posting the recipe and directions for the divine and very impressive 4th of July Flag cake James made last year. Until I saw him do it, I would have thought it was far too difficult and never gotten farther than looking at the recipe online. But as you can see below, the recipe itself is super easy, it’s just the putting it together that’s a challenge. If you like puzzles, you’ll be in heaven. If you don’t, well, you can just stuff handfuls of cake and frosting in your mouth. Three vanilla cake mixes (+ eggs, oil and whatever else they call for) — read the box and get the extra items before you leave the store. You could of course make the cakes from scratch, but why? One bottle of red food dye and one bottle of blue food dye. You know, the little ones that come in the red, yellow, green, blue pack. 2 9″ cake pans. You will, of course be making six cakes total, so budget your time accordingly. First, read this all the way through before you start. Seriously. 1. Bake two 9″ vanilla cakes as directed on the mix box. Add the entire bottle of red food coloring to batter as you mix it for 2 minutes. Don’t even think about the perils of red dye #2 or whatever the current toxic number is. You want to celebrate America, don’t you? 2. Bake two more 9″ vanilla cakes as directed on the (second) mix box. Do not add any color. 3. Bake TWO MORE 9″ vanilla cakes. (See what I mean about budgeting your time?) Pour half of the batter into the cake pan, then pour blue food coloring into remaining batter. Use as much as necessary to achieve the proper blue color — I found I only need 1/2 a bottle, but perhaps my America blue is different from yours. Experiment. 4. First, set up your cake stand/plate by placing four strips of wax papers around the edges in a square shape. 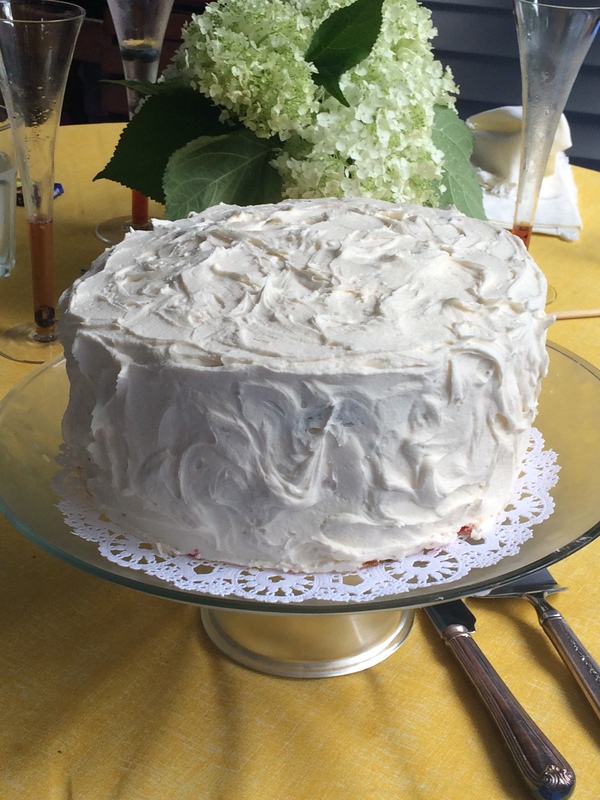 Put a dab of icing in the middle of the square to anchor the bottom cake layer. 5. 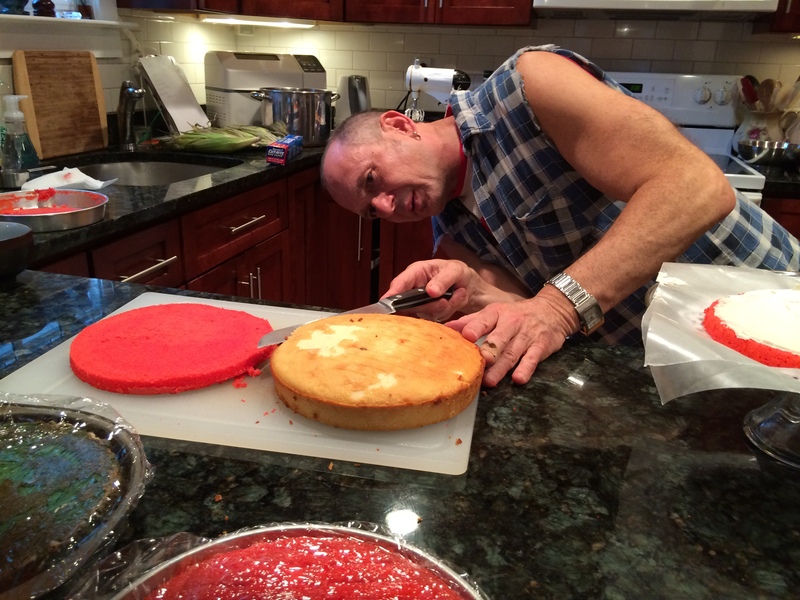 Slice one red cake in half horizontally to make two red layers. Then slice one white cake the same way to make two white layers. 6. 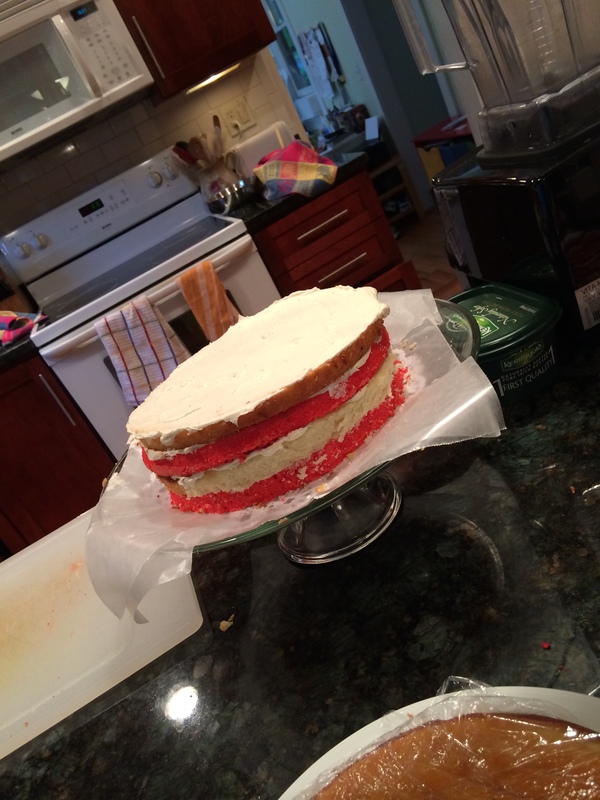 Place one red layer on the cake stand and frost. Then place a white layer on top and frost. Repeat with one more red and white layer. Frost the top white layer. 7. Now, take your blue layer (do not slice this layer in half horizontally!). 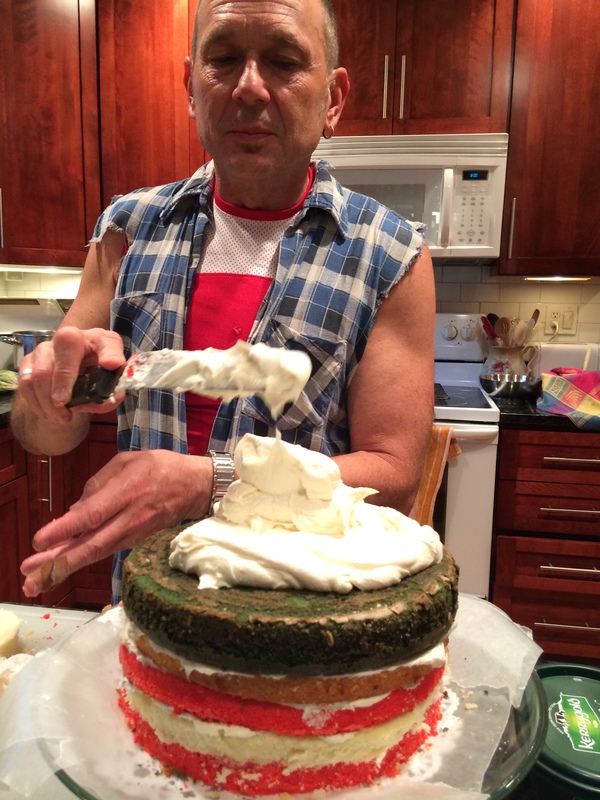 Using your 4″ bowl or tin, cut a 4″ circle down into the cake. Remove blue cake plug and set aside. Place blue layer with the center missing on top of red/white layers. 8. Okay, still with me? You should have one unsliced red and one unsliced white cake left. Go ahead and slice them horizontally now. (You could do this step earlier when you slice the other ones — I just did it now because it kept things a little more organized in my head.) Take one of the half slices of red and cut out a 4″ circle. Do the same with the white half slice. Put the leftover cake aside. 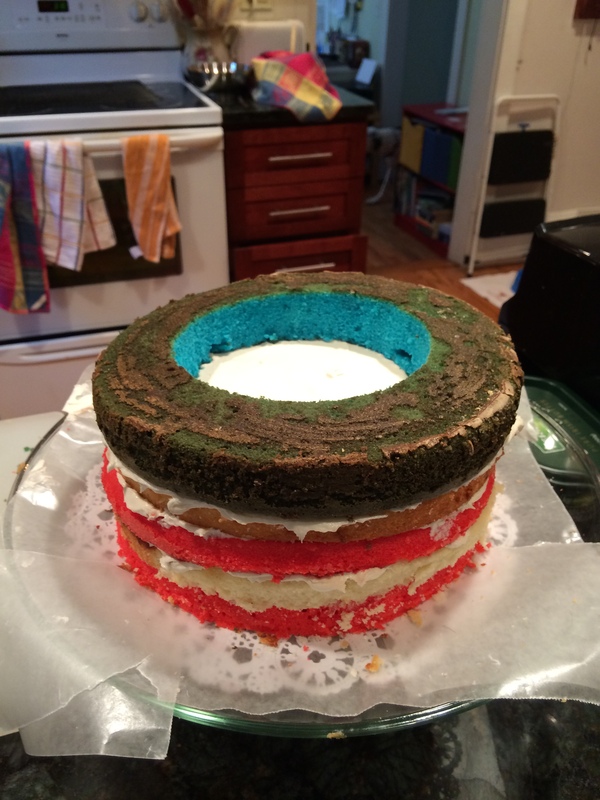 Frost the top of the 4″ white circle and insert it into the blue cake. 9. 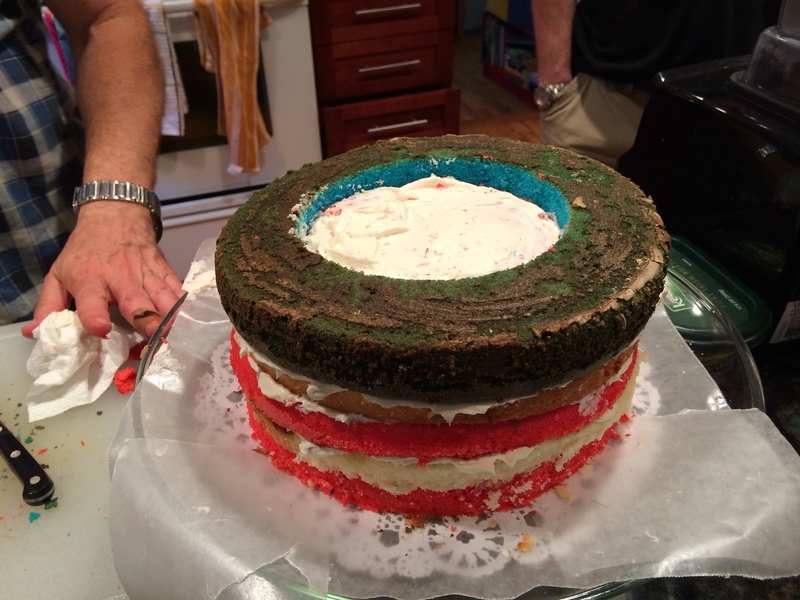 Insert the red 4″ circle into the blue cake and you are finished assembling the cake! Of course, now that I’m finally posting this, I think maybe a rainbow cake would really be the thing for this holiday. Hmm . . .